SD Card is a storage card in digital cameras, handheld and mobile computers, cell phones, music players, video game consoles, and other electronics to save data. But sometimes, data loss happens unexpectedly due to accidental deletion, formatting, the raw issue with SD Card error, virus attack or some other reasons and then erase your files like photos stored in the SD card. How to recover deleted files on SD Card? If you met the same or similar situation mentioned above, You need to understand that the deleted/lost data are always hidden somewhere in your card, just you haven't found them yet. Hurry up! All you need is the best data recovery software. And you still have chances to recover deleted files on SD card. Bitwar Data Recovery is a fast, reliable and free trial best data recovery software with powerful functions. It supports recovering all data type, including photos, music, PDF files, videos, Documents from computer hard drives, retrieving formatted USB drive and all storage media like SD Cards, CF Cards, etc. With its powerful data recovery capacity and wizard-like interface, it is the best choice to recover deleted files from SD card. Whatever your initial causes are, Bitwar Data Recovery is guaranteed to solve them all. Next, we will show you how to use Bitwar Data Recovery software to recover deleted files step by step. 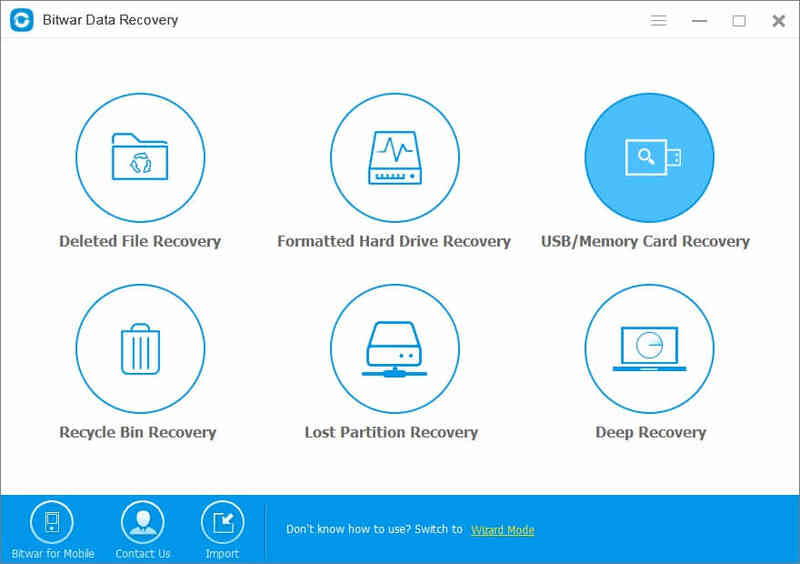 Free download and install Bitwar Data Recovery on your computer on our official website (http://www.bitwar.net/data-recovery-software/). Then connect your SD card to the PC and follow the next simple steps to retrieve your data back. Please make sure your SD card has connected to the computer, select it and click "Next." Select the type of files. The Bitwar Data Recovery supports all file types: pictures, videos, audio, emails, documents and others. You can select several file types then click on the button "Next" . Bitwar Data Recovery will start to scan. You can pause your recovery progress temporarily and resume later. Also, you are able to Export and import scanning results if necessary. After a scan, you can make a selective recovery with Preview before recovery to determine which one you want. Choose the data you want to retreive from the scanning results. Click "Recover" button to get them back. Here you should save all the recovered files on computer disk to avoid data overwriting. Following this action, the deleted files on SD Card has been recovered. It's easy, isn't it? Note: DO NOT save the files into your SD Card where you lost data. Please select a safe folder on your computer to keep them. When the restore is complete, you can move the data back to SD card. Summary：A memory card, flash card or SD card is an electronic flash memory data storage device used for storing digital information. These cards are designed to be small, portable as well as its large storage space.